Lovely detached holiday home, newly furnished and with beautiful views of the surrounding area. It is surrounded by a large garden divided into multiple terraces, with one terrace in front of the house that is partly covered and has garden furniture and several sun loungers. The interior of the home is very well-kept and beautifully finished. The comfortable kitchen-diner is fully equipped and has sliding doors opening out onto the terrace. The living rooms and rooms are spacious and the second floor has a large landing which can also be used as a play area. The home has three large bedrooms and a fourth children's room. You're situated on a hill, at the foot of the hill lies a small, quiet family campsite (only 150/200 spots). You're free to use the campsite's facilities: among others, the enclosed swimming pool with adjacent children's pool, small bar, playing equipment for the children, table tennis table, table football game, and pétanque. 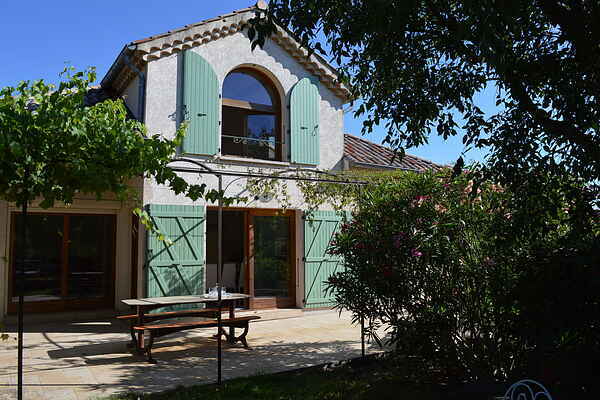 This holiday home is just 2 km from the town of Les Vans. This lively place has charming cafe terraces, shops, a market and supermarket, restaurants, and a cinema. In Chambonas (5 km), you can hire a bicycle and in the village of Les Assions (5 km) you can hire a canoe (age 7 and older) for an adventurous trip on the river. For beautiful hiking through a stunning area of nature, head to Bois-de-Paiolive (6 km), with its limestone outcrops, which have been formed into amazing shapes by the sun, rain, and wind.